This is NOT your grandmother's crochet! Sofia from Sofia Sobeide has a fresh approach to her yarn creations. This young designer from Turku breathes fresh air into every piece she works on through her choice of yarns, colors, and patterns. She works hard to make wearable, fun products of a high quality that still have a cute twist to them. 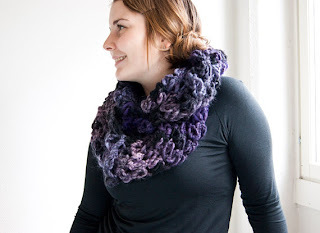 She can keep you warm and cozy with soft, cuddly snoods, cowls, gloves and scarves. Yes, it is spring but the days are still cool here in Finland and scarves are worn pretty much year round. This lovely lacy scarf can be worn in different ways, and will definitely chase out the chill in the air and your heart. Maybe you want something more whimsical or spring like? 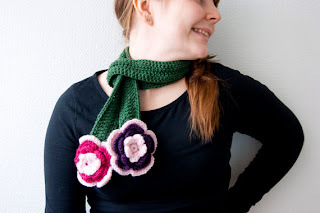 This lovely skinny scarf with its bright crocheted flowers just might do the trick and it will take you well into summer. How about something fun and bright? 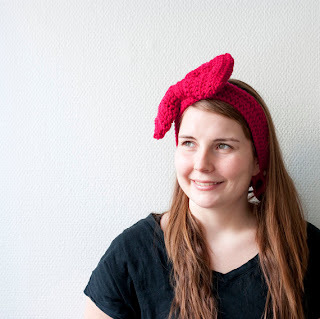 Sofia has this delightful big red bow on a soft cowl. She has thoughtfully attached vintage buttons to it so that you can adjust the length and wear it as a cowl or a headband. Sofia also has a knack for those fun amigurumi (think small animals in crocheted yarn) creatures. She has a growing collection of bears, birds, dragons and more. Some have been made into soft baby toys or rattles. Others are guaranteed to bring a smile to your face. 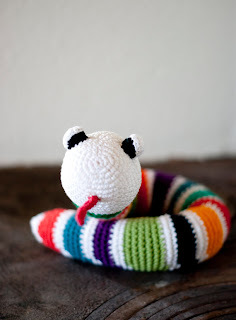 What baby would not enjoy this colorful snake? She also has patterns for sale. She will help you decorate your home with pretty garlands, practical items for your kitchen, and a whole separate store of jewelry. All in all, this is one busy, talented artisan that you will want to visit again and again. We do hope you will enjoy her works. Cross stitching in Finland with Texas spice!